and I will try to accommodate your needs. If I do, I will give you express written permission. please read and comply. Also, please keep my tags in tact! You may NOT sell your creations made from my images to major chain stores, wholesalers, retailers or franchises, publishing houses, wrapping paper companies, greeting card companies, magazines, newspapers, advertising agencies, television stations, broadcasting corporations and the like. You may not mass produce my images. You cannot offer anything from my site for sale on a CD, or as a general graphic collection. You may not create commercial calendars or illustrate books. You may not pass any of my images through any graphics group on or offline. 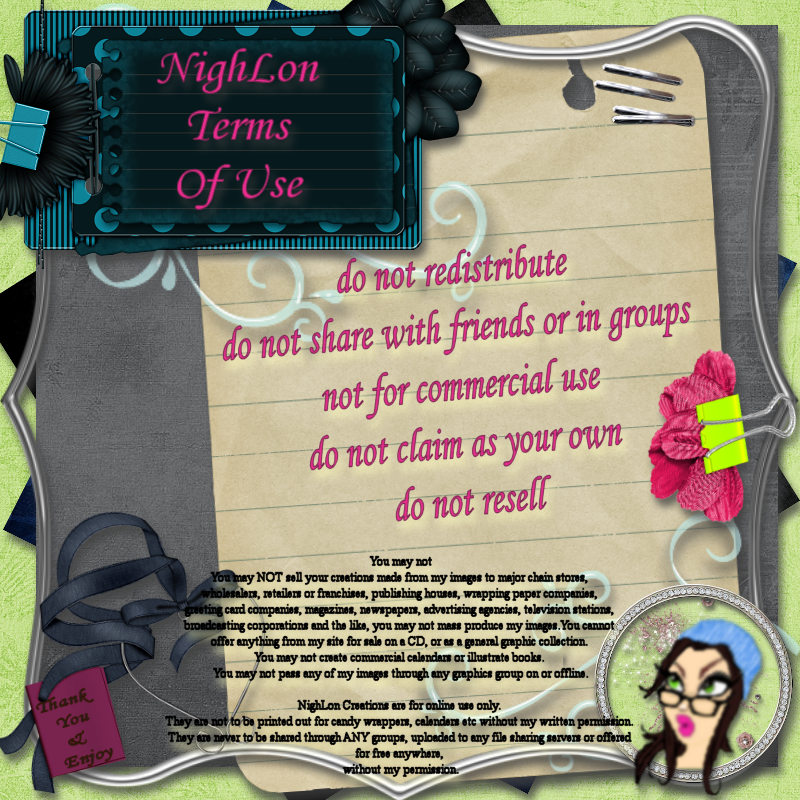 NighLon Creations are for online use only. They are not to be printed out for candy wrappers, calenders etc without my written permission. They are never to be shared through ANY groups, uploaded to any file sharing servers or offered for free anywhere, without my permission.